Immaculate pair of Ficks and Reed armchairs. New upholstery fitted cushions, ivory contrasting welt. 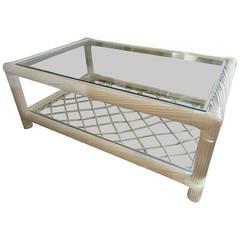 A Ficks & Reed bamboo and cane coffee table. We also have two matching side tables and a pair of high back armchairs all the same match and period. A midcentury Ficks and Reed bamboo wall mirror, beautifully made, silver backed.,sligh ware. A Ficks reed painted bamboo coffee table. Two levels with glass inserts, lattice work on second level. Restored condition, painted in an oatmeal beige. Excellent condition. Showing a pair of Ficks & Reed end tables in bamboo and cane, we also have the matching coffee table and two high back chairs. Pair of Ficks Reed armchairs. Newly restored from the 1960s. New strapping. The cushions have original block printed linen. Hollywood Regency style faux bamboo rattan armchair with a high fan back by Ficks Reed. Pair of Italian bamboo armchairs from 1960s. Measurements: cm.58 x 64 x H 88/seat H 38. Pair of wood faux bamboo wood armchairs. Pair of English style faux bamboo armchairs with cane woven seats and custom plaid upholstery, circa mid-20th century. A vintage 1960s French bamboo and rattan armchair in a perfect condition.